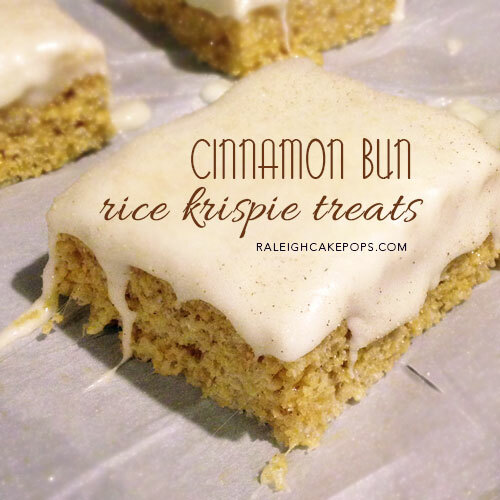 CINNAMON BUN RICE KRISPIE TREATS! After opening our new cake pop shop in Creedmoor, North Carolina, we’ve been busy creating new desserts for our customers and I just know this one will be a winner. This recipe makes 9 good-size treat squares and can easily be doubled for a 1/4 sheet pan. PREP: 9″x9″ Pan lined with Parchment Paper or Greased Plastic Wrap. In a large pot or saucepan, melt butter and marshmallows over medium heat until smooth. Remove from heat and add cinnamon and molasses. Once combined, fold in rice cereal. With a buttered/greased spatula or buttered hands/gloves (preferred method) , pour mixture into prepared pan and form to pan. Allow to cool/set for 30 minutes. With an electric mixer, whip butter and cream cheese. Add vanilla. Slowly, on low speed, incorporate confectioners sugar until smooth (you may not need all of the sugar). Cut treats into 3-inch squares. Separate squares and frost (so the frosting drips down the sides a bit). TIP: Warm frosting in microwave for 15 seconds and pour over individual treats. Smooth with a spatula.